Bluetooth Wireless Music Streaming Compatible with Any Smartphone, Tablet, PC, etc. FM Stereo Receiver with Auto Scan and Frequency Display Allows You to Listen to All Your Favorite Radio Broadcasts with 60 station memory presets. USB/SD Flash Drive Memory Compatible. USB Port for Mp3 and Also Recharges Your Cellular Phone. LED Screen Shows FM Frequency, and Mp3 Song Number and Play Time. Bluetooth Function With Operation Range 65 feet. 1/8" AUX Input with Cable and Two1/4" mic Inputs. RCA Input and RCA Line Out. Full Function Blue LED Control Panel w/ Pre/Next/Play/Pause for USB/SD. 4 inch three-way indoor/outdoor box speaker. impedance: 4 to 6 Ohms. Sensitivity: 85 dB 2.83v @ 1 Meter. Dimensions: 31.14 H x 2.09 W x 2.09 L.
SPEAKERS SPECS: This Enrock Audio 3-Way Universal Indoor/Outdoor Speakers. 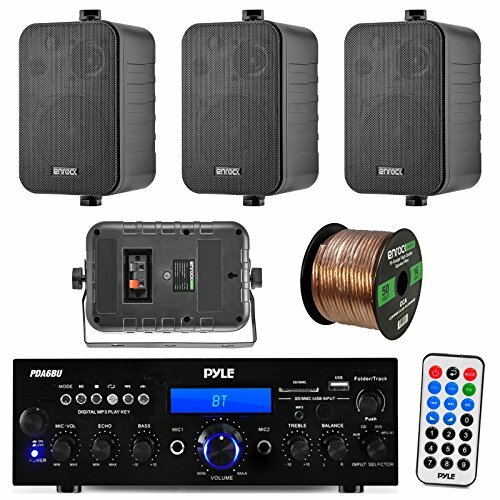 Make your Home / Boat Power sport Vehicle more pleasant and enjoyable with top-drawer speakers that will change your and your family world of sound, The audio speakers are made extremely durable to provide years of reliable and hassle-free service, Fully Marinized Weather Proof. We integrate high-tech, state-of-the-art waterproofing materials plus special UV coatings for plastic surfaces. SPEAKER WIRE: 50 Feet - 18 Gauge - The EnrockBasics Speaker Wire lets you easily do it yourself connect your speakers to to your audio equipment like receivers & amplifiers, Great for Cars, in-home, automotive, auditorium, school, church or business settings. If you have any questions about this product by PyleAudioBundle, contact us by completing and submitting the form below. If you are looking for a specif part number, please include it with your message.